The night before you smoke, mix together the pepper, paprika, sugar, salt, and 1 teaspoon the dry mustard, and cayenne. Rub over the surface of the ham, wrap in foil, and let sit in the refrigerator overnight. The next morning, remove the ham from the refrigerator and let it sit for 1 hour. Remove foil. Prepare the smoker. You will be smoking at about 210 F/100 C for 6 hours. Mix together the chicken stock, 3/4 cup of the pineapple juice, vegetable oil, 1/2 teaspoon dry mustard, and ​cloves. Warm over medium heat until completely mixed. Place ham in the smoker and baste with sauce once every hour. 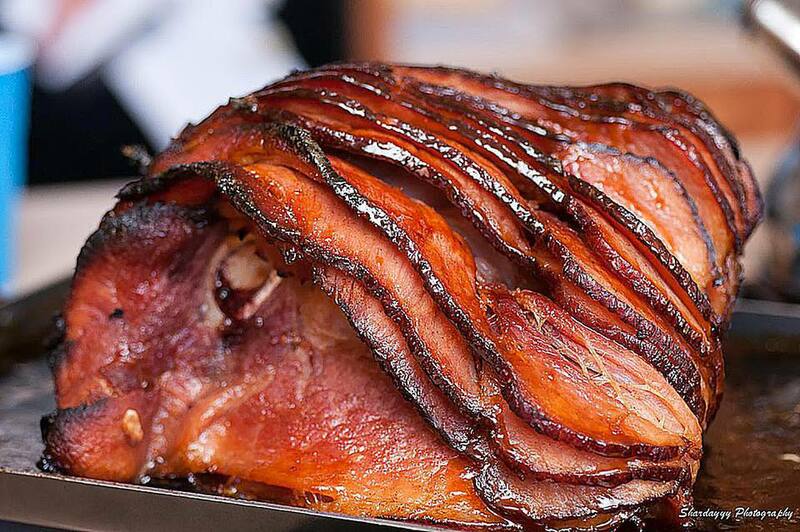 You might want to score the ham before you smoke it. This makes for an attractive presentation, and it will allow the glaze and smoke to penetrate the meat better. With a sharp knife, score the surface of the ham in a diamond pattern. For extra flavor, if desired, insert a whole clove into each cut intersection or in the centers of the diamonds.